As men, women and children continue to die in the Mediterranean Sea, international medical humanitarian organisation Médecins Sans Frontières/Doctors Without Borders (MSF) and its partner SOS Méditerranée have been forced to terminate the lifesaving operations of their search and rescue vessel, Aquarius. Over the last two months as people have continued to flee by sea on the world’s deadliest migration route, the Aquarius has remained in port, unable to carry out its vital humanitarian work. This is due to a sustained smear campaign, spearheaded by the Italian government and backed by other European countries to delegitimise, slander and obstruct aid organisations trying to save the lives of vulnerable people in the Mediterranean. Coupled with ill-conceived policies aimed at trapping people outside Europe’s borders, this campaign has undermined international law and humanitarian principles. With no immediate solution to these attacks, MSF and SOS Méditerranée have no option but to end the operations of the Aquarius. “This is a dark day,” says Vickie Hawkins, MSF UK’s Executive Director. “Not only has Europe failed to provide dedicated search and rescue capacity, it has also actively sabotaged others’ attempts to save lives. "The end of Aquarius means more lives lost at sea; more avoidable deaths that will go unwitnessed and unrecorded. It really is a case of ‘out of sight out of mind’ for UK and European leaders as men, women and children perish." During the past 18 months, European attacks on humanitarian search and rescue operations seem to have come from the playbook of some of the world’s most repressive states. Despite working in full compliance with authorities, the Aquarius was twice stripped of its registration earlier this year and now faces allegations of criminal activity – allegations we categorically refute. Amid these smear campaigns and manoeuvres to undermine international law, people rescued at sea have been denied access to safe ports, refused assistance from other ships and left stranded at sea for weeks at a time. In addition, the UK and European governments have further fuelled the unnecessary suffering of thousands by enabling the Libyan coastguard to intercept more than 14,000 people at sea this year alone and forcibly return them to Libya. This is in clear violation of international law. In 2015, Europe made a commitment to the UN Security Council that nobody rescued at sea would be forced to return to Libya. A nightmarish day on the Mediterranean in January 2018 as 99 survivors from a sinking rubber boat are rescued by Aquarius but an unknown number of men, women and children are missing, presumed drowned. Karline Kleijer, MSF’s Head of Emergencies, says: “Today, the UK and its European counterparts are directly supporting forced returns while claiming successes on migration. The Aquarius’ last active period of search and rescue ended on 4 October 2018, when it arrived in the port of Marseille following the rescue of 58 people. 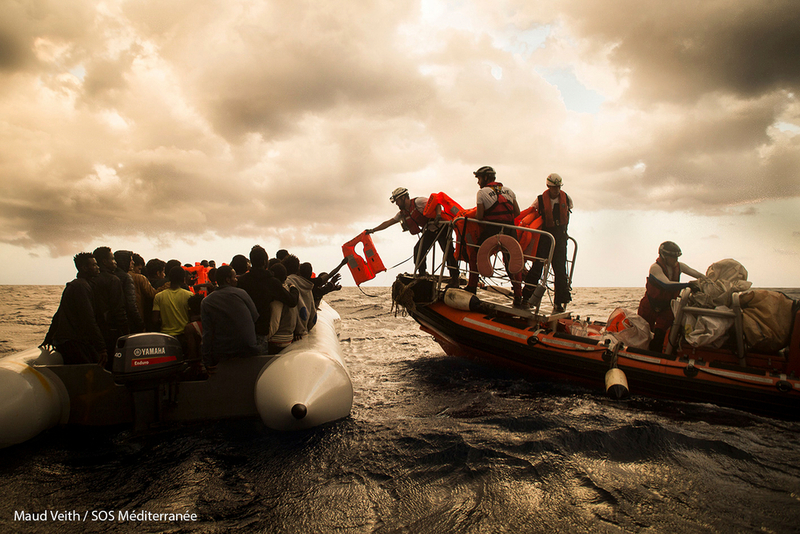 Together with MSF’s previous search and rescue vessels – the Bourbon Argos, Dignity, Prudence and Phoenix – MSF has rescued or assisted more than 80,000 people in the Mediterranean Sea since 2015.